The differences in how teachers approach samples, topics, and prewriting are important in that they help to frame writing tasks as governed by communicative needs rather than classroom needs. In classrooms such as Ms. Barrera’s, rhetorical situations presented themselves much as they do in the world outside the classroom, and it was up to students (with the teacher’s support) to navigate those situations by developing ideas, choosing tools for invention and planning, and making all of the other decisions writers must make. In Ms. Gonzales’ classroom, writing was usually framed as necessary for school assignments more than for communication, and tools and support were made available to assist students in meeting the requirements of these school assignments. Whitney, Anne, Sheridan Blau, Alison Bright, Rosemary Cabe, Tim Dewar, Jason Levin, Roseanne Macias, and Paul Rogers. 2008. 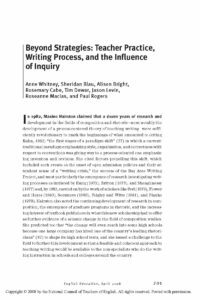 “Beyond Strategies: Teacher Practice, Writing Process, and the Influence of Inquiry.” English Education 40 (3): 201–230.